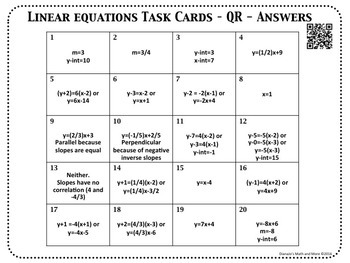 These Task Cards cover it all! 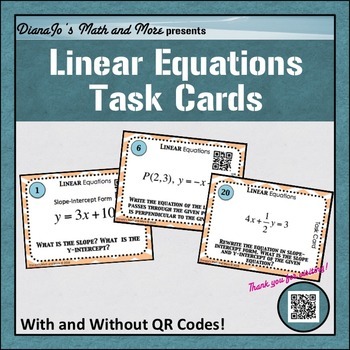 These are a great review for all forms of linear equations. Some questions cover the basics while others are more challenging. 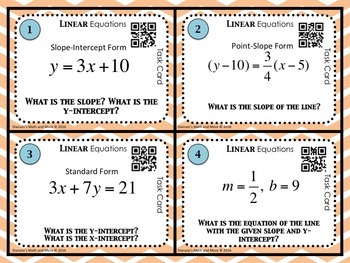 Point-Slope, Slope-Intercept, and Standard Forms are all represented. They will find lines that are perpendicular and parallel to given lines. They will decide if two lines are parallel, perpendicular or neither. You can see ALL of the task cards in the preview! Students get to have a little fun in math class practicing Linear Equations! This is sure to be a favorite for students and teachers alike. These print great in BLACK AND WHITE! You may use these for your classroom. 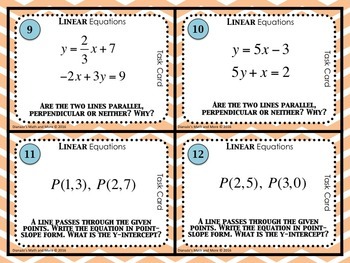 If fellow teachers would like to share these, you can purchase additional cards at half price! Please do not share these. All items are copyrighted. I'd love for you to know when my next product is available! You can do this by clicking on the green star next to my logo and whenever something new is posted, as a follower you will be the first to know! Did you know that giving feedback provides you with TpT credit on future purchases? All you have to do is go to your My Purchases page and beside each purchase is a feedback button. Simply click it, rate the product and leave a comment. As always, I appreciate your feedback! I hope you enjoy this fun activity! There are more coming soon and I can't wait to share them with you!